Then why do so many people stay in their current position? Why are they stuck in a rut doing the same thing they have done for years and repeatedly passed over for promotions? Regardless of reasoning, obtaining a promotion may be more attainable than you realize and the tips below should help you speed up the process of advancement at your firm. Are you excelling in your current position? No employer is inclined to enhance your role until you’ve demonstrated mastery of your current position. Go back through your performance reviews to identify strengths and weaknesses. Self-reflect to discern if your work achieves the highest standards across the board. Also, ask for a peer review from select co-workers. Once you have completed this self-evaluation, then turn your focus to making any necessary improvements based on feedback you have received. Additional questions to ask yourself: Do you go above & beyond on a daily basis? Do you exceed expectations or do just enough to get by? Do you over-promise or do you over-deliver? The surest way to a long-term, growth-oriented career trajectory is to make yourself so valuable that your employer would be hard pressed to do without you. 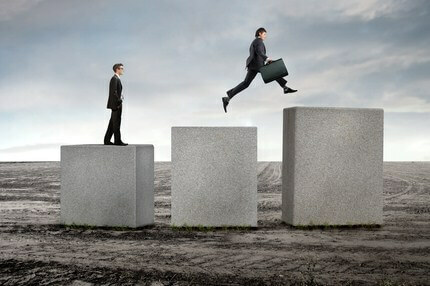 Find a task, process or project that you can execute at a level beyond anyone else at your firm. Your boss will love having the comfort of knowing that you will get it done well every time and reputation for mastery of this skill will spread throughout the company with your chances of moving up increasing accordingly. Have you ever heard the saying that “you should dress for the job you want”? This is more than a saying as your appearance can help upper management better visualize you stepping into a more senior role. Professionalism also extends past the outward appearance and includes the way you communicate. Make sure that as you are seeking greater levels of responsibility at your firm and that you continuously hone your communication skills—verbal and written. The best way to be noticed for a promotion is to look and conduct yourself for the part. Are you your own advocate? Make sure when the time comes to make “the ask” that you do it well as a good business case is hard to turn down. By seeking a promotion, you are asking the company to invest time and money in you. It doesn’t matter if you have worked hard, been there longer than anyone else or watched as your peers have been promoted, you must be able to explain what value you add to the company. If you want a promotion, highlight your successes and sell your boss on how advancing you increases the company’s bottom line. No one is going to give it to you—demonstrate you are worthy of a raise. One additional tip is to write down your “ask” as well as responses to questions you anticipate that your supervisor may ask. Just like an interview, in the days leading up to your discussion, it makes sense to verbally practice for how this meeting may transpire. The more you practice, the more confident you will be when you are actually in front of your boss. Does your boss know your goals? Prior to the meeting where you make your ask, set-up a time to meet with your manager to discuss your short-term and long-term objectives. Then incorporate his or her input on how best to achieve those goals. Hopefully this meeting helps you set measurable milestones in order to monitor progress. Also, consider taking on extra work to prove you can handle additional responsibilities. If available, take advantage of cross-training opportunities within different departments to help speed up the timeline. Have you built strong relationships at work? Business is built on relationships. Internal networking within your firm is just as, if not more, important as industry-wide networking. Develop relationships outside of your department and most importantly, position yourself to have face-time with key decision makers in both business and social situations. Participate in company initiatives such as listening to earnings calls or volunteering for firm-wide philanthropic activities. On a related note, seek to cultivate a relationship with a potential mentor. This can be someone who can help you define your path and introduce you to the right people. Pursue individuals who are in positions you someday hope to have. Everyone wants to be valued and rewarded for hard work and achievements. To take advantage of a promotion opportunity, not only do you have to go above-and-beyond in your work performance, but you also have to act the part, make your intentions known and prove to the company that promoting you is in the best interest of the business. In short, if you can prove how you deliver value and improve the bottom line, your big promotion could be right around the corner!